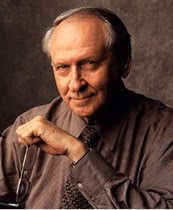 Pulitzer Prize winning columnist William Safire died on Sunday, September 27th, 2009, of pancreatic cancer. He was 79 years old. Safire gained prominence as a speechwriter for Richard Nixon, but in 1973 left Washington to became columnist for the New York Times, where for many years he was the sole conservative voice in the paper's Op-Ed pages. In addition to his award winning column, he also wrote the popular "On Language" column for the New York Times Magazine. Many of his essays were later republished in a collection of bestselling books examining etymology and the use and abuse of the English language. He was also the author of four novels.